Since I started my Design Studio- Tarek Atrissi Design– Back in 2000; we have been more and more involved in designing Arabic Typefaces- which resulted from our focus in our work on Arabic Typography and on creating modern Arabic Graphic Design. The Lack of variety of Arabic typefaces made us develop our own fonts for some projects, particularly corporate identity projects. Eventually We started putting more effort in making our own fonts, and on delivering custom Arabic fonts for a variety of our clients. The Challenges are always many- but I always enjoyed the process of Type Design- and juggling Design and technology; And Type Design is one of the studio’s main focuses today. Several of our fonts will be soon available for sale, since I have launched a new typographic Design in the office, focused only on type design. I am presenting here an overview on some of the Typefaces developed over the last six year. 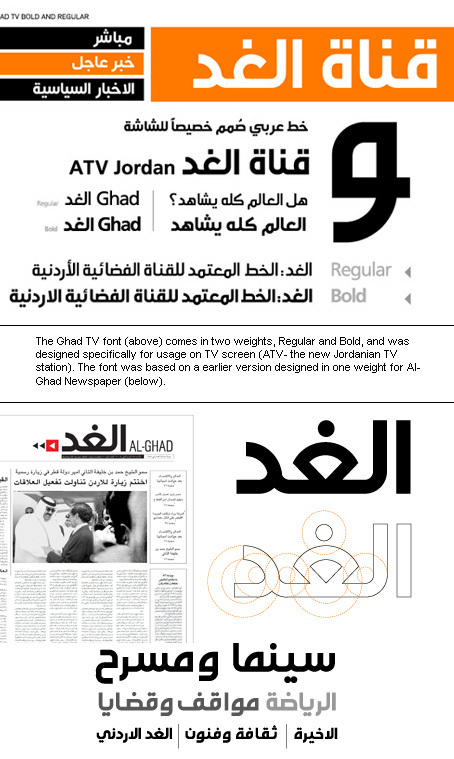 This year I completed the work on Al-Ghad font- for the New Jordanian TV station ATV. The font comes in two weights, bold and regular, and was designed Particularly for screen usage. This font (shown Above) was based on a previous font developed for Al-Ghad newspaper, which was used for the masthead and for the headlines of the newspaper, back in 2004. 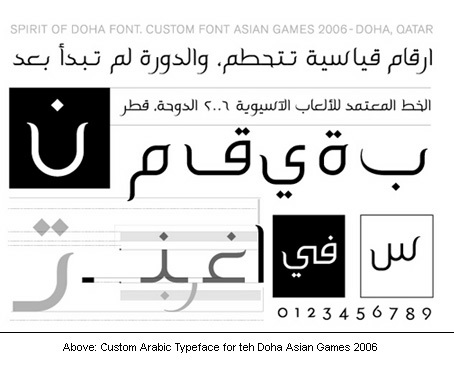 Another Font developed in 2004 was the Spirit of Doha Typeface, developed for the Asian Games 2006, that will launch in around two weeks in Doh Qatar. With the opening ceremony approaching, it is so great to see the typeface in use everywhere in and outside Qatar, promoting the event. 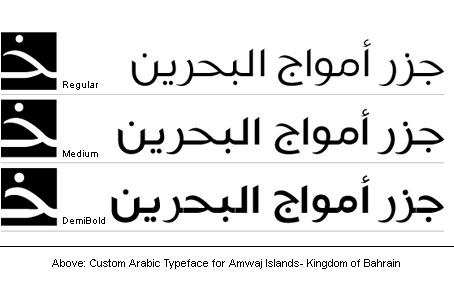 This year I completed the type family for Amwaj Islands in Bahrain, that needed a three weights font for use as the main Arabic font in their corporate identity. A preview of the font is shown above. 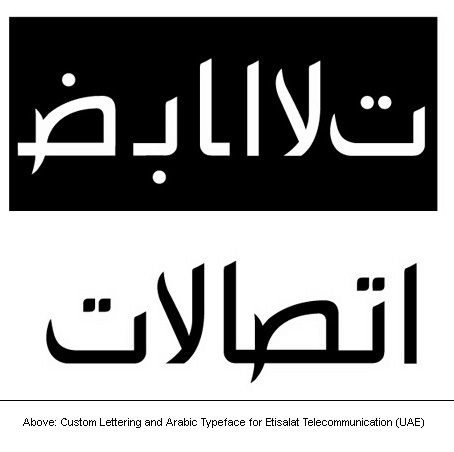 One of the most exciting fonts developed this year as well was the Etisalat font- shown above. This started as an assignment to do the corporate lettering of Etisalat’s new identity- and we carried further eventually to develop the typeface. the Lam Alef is one of the main and distinctive characters in this font. Another Custom Typeface developed recently is the AYNA font, designed as part of the launch of the new corporate Identity for Ayna.com, the Arab online Portal. The font was based on square Koufi and after developing the lettering for the “Ayna” word, used in the logo, the entire font was designed and is in exclusive use now by Ayna.com. The full process of designing this font (as well as others mentioned above) will be posted soon. 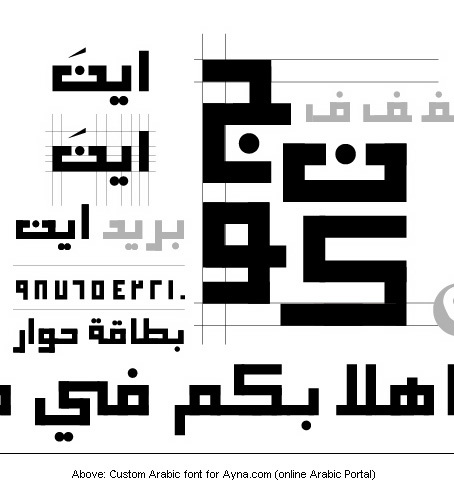 We will be posting all our Arabic fonts soon on a seperate website, www.atrissitype.com, the typographic division of Tarek Atrissi Design Design.